World of Warcraft’s upcoming Battle for Azeroth expansion features what looks to be laser-wielding dolphins that you can ride around underwater. 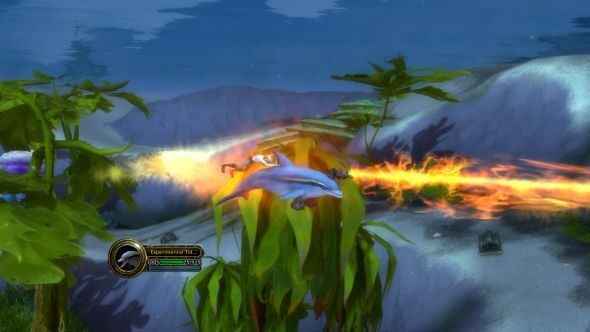 A picture of the dolphin was posted to the World of Warcraft subreddit last night. At the centre of the image is, quite clearly, an angry-looking dolphin with a laser strapped to its head, which is pretty cool. If you look closely, you can see a figure in an old-style diving helmet holding onto the dolphin’s dorsal fin. Underneath the dolphin are what appear to be two saddlebags or something similar, which could relate to the name of the quest that it appears to be involved in – in the top right of the image, the player can be seen to be ready to turn in a quest called ‘Deadliest Cache: Sink and Swim’. While you wait for World of Warcraft: Battle for Azeroth, why not check out a list of upcoming PC games? It’s worth noting that this extremely good aquatic friend (which you can get a closer look at on Reddit) is probably neither a mount nor any type of travel form. The appearance of the old-timey diver behind the dolphin means that it’s probably part of a specific quest, and not something that you can use within the game at large. Dolphin character models were first datamined for Battle of Azeroth back in February, along with a whole host of other treats. So far there’s a frog mount, new allied races, and some impressive raid armour. Oh, and the entire Battle for Azeroth story has been datamined, too. Battle for Azeroth’s release date is August 14, so sadly you’ve got a little while longer until you can meet this excellent new addition to World of Warcraft.